This evening's music features an assortment of tunes I ran across while putting together other features. Enjoy! Today, hundreds of newspapers, at the initiative of The Boston Globe, are purporting to stand up for a free press against Trump’s rhetoric. Today also marks exactly one month since I was dragged out of the July 16 Trump-Putin news conference in Helsinki and locked up until the middle of the night. As laid in my cell, I chuckled at the notion that the city was full of billboards proclaiming Finland was the “land of free press“. So, I’ve grown an especially high sensitivity to both goonish behavior toward journalists trying to ask tough questions — and to those professing they are defending a free press when they are actually engaging in a marketing exercise. The Federal Communications Commission (FCC) kicked a pirate radio station known for rebroadcasting Alex Jones off Austin’s airwaves on Wednesday and handed the station’s operators a $15,000 penalty, according to the Austin-American Statesman. The operators had refused to pay as of late Wednesday. The Genesis Communications Network still carries Jones’ show to affiliates across the country. He’s said that 160 broadcasters nationwide carry his show. Michelle Higgins was protesting a high-profile police killing in St Louis when the officers grabbed her. The activist’s arrest for “failure to disperse” on 15 September 2017 wasn’t the only punishment she faced for marching. When she was released a day later, she learned that the police department had posted her name, age and address on Twitter, alongside 32 others arrested during the chaotic demonstrations sparked by the acquittal of an officer. Most of the arrests did not result in charges, but the damage was done. It’s a law enforcement tactic that activists say has become increasingly common: police arrest protesters en masse, publicly shame them on social media, and then drop the cases. The strategy can lead to intense online abuse for Black Lives Matter activists and other protesters. In the case of anti-fascist protesters, some critics argue that police are also boosting the agenda of neo-Nazis and white supremacists by exposing counter-protesters’ identities – and branding them violent offenders before they’ve gone to court. “You criminalize folks who are trying to hold people accountable, then you dehumanize them by telling everyone where they live,” said Higgins, who was not prosecuted after her arrest. The St Louis police tweets, she said, posed an “active threat” to activists and sent a message that “these animals were out protesting when they should’ve been sitting at home”. Although rightwing extremist groups have a documented record of violence and killings, the police response at far-right events in recent weeks has repeatedly targeted the leftwing resistance. Some of the news coverage has also focused on the alleged threats of “antifa”, or anti-fascists. Law enforcement, who have also faced scrutiny for working directly with rightwing and neo-Nazi groups to build cases against anti-fascists, largely defended their tactics. At least 450 Yemenis were killed in the first nine days of August, making it one of the bloodiest periods since the war broke out three and a half years ago between Houthi rebels and the Yemeni government. And it could get a lot worse. An international coalition led by Saudi Arabia and the United Arab Emirates, and backed by the United States, is preparing to retake the strategic port city of Hodeidah. The operation could prove disastrous for Yemen’s most vulnerable: 70 percent of Yemen’s goods enter the country through Hodeidah, so a protracted battle could quickly turn into a humanitarian disaster where millions of people are prevented from receiving food and aid. A battle in Hodeidah city itself would be one of the deadliest in a war that has already claimed more than 10,000 lives and thrust 23 million more into the world’s worst humanitarian crisis. More than 120,000 civilians have fled the city in anticipation. It’s easy to see why. Not long after government forces started their push, ambulances began rolling up outside the one semi-functioning hospital in the area. Ten-year-old Mohammed was the first civilian to be caught up in the crossfire. Ali Jalmoud says his son was playing in their house when a Houthi mortar hit. Dr. Mahdi Ba-Kather is the one remaining doctor in a local hospital, and he’s been struggling to cope with the influx of casualties. U.S. officials had earlier told CNBC that the parade through Washington, D.C., originally intended to mark the centenary of the end of World War I on November 11, would cost about $92 million, according to estimates. About half would cover security, with the rest going to expenses such as transportation of equipment to the event, aircraft, and temporary duty for troops. Earlier this year, a White House official told Congress that the cost would be between $10 million and $30 million, while a Defense Department estimate last month put it at $12 million. Trump’s military parade: $92 million. Clean water in Flint: $55 million. The UN human rights committee ruled on Friday that Brazil’s imprisoned leftist leader Luiz Inácio Lula da Silva cannot be disqualified from upcoming presidential elections because his legal appeals are ongoing. The committee issued the finding following an urgent request filed by Lula’s lawyers on 27 July. In a statement, the panel “requested Brazil to take all necessary measures to ensure that Lula can enjoy and exercise his political rights while in prison, as (a) candidate in the 2018 presidential elections”. The committee said Lula cannot be barred as a candidate “until his appeals before the courts have been completed in fair judicial proceedings”. The Geneva-based committee monitors a member state’s compliance with the international covenant on civil and political rights, as well as a supplementary text called the optional protocol. Because Brazil has ratified both texts, it is technically obligated to abide by the committee’s findings. Google Executives Misled Staff in Meeting on China Censorship. Both Pichai and Brin’s statements to Google employees raise a number of questions. Pichai’s attempt to portray Dragonfly as an “exploratory” project contradicts information contained in internal Google documents and statements made by senior Google officials on Dragonfly and seen by The Intercept. As recently as last month, Google’s search engine chief Ben Gomes told Google staff who were working on Dragonfly that they should have it ready to be “brought off the shelf and quickly deployed.” ... Through the process, Pichai repeatedly traveled to China, meeting with top Communist Party officials, such as Wang Huning, one of President Xi Jinping’s top advisers. Dragonfly was well beyond the “exploratory” stage. Anyone who was expecting Democrats to aggressively and intelligently grill FCC chair Ajit Pai over his egregious lies about his agency's fabricated "cyberattack" story or his deeply unpopular net neutrality repeal was disappointed after the Senate Commerce Committee's much-anticipated oversight hearing on Thursday, which ultimately ended up being a "complete joke" that produced little of substance and few answers to important questions. This FCC Congressional oversight hearing is, as usual, a complete joke. Softball questions, misrepresentations galore. You'd hardly even know three FCC staffers were just proven to have repeatedly lied to the press, public and Congress about a DDOS attack that never happened. Craig Aaron, president of Free Press, echoed Bode's critique of Senate Democrats on Thursday, arguing that if a Democratic FCC chair was accused of misleading Congress and the public like Pai has been, Republicans would have ruthlessly demanded answers. Undettered by lawsuits, federal court rulings, and widespread moral outrage over its efforts to strip life-saving healthcare from tens of thousands of vulnerable Americans, the Trump administration is reportedly planning to sign off on yet another flurry of waivers that would allow Republican governors like Wisconsin's Scott Walker to impose deeply cruel work requirements and other punitive restrictions on Medicaid recipients. "If you're poor or disabled, the GOP wants you to die," actor and democratic socialist Rob Delaney wrote in response to a new Politico's report late Thursday detailing the Trump administration's plan to approve a "new round" of Medicaid restrictions in Maine, Arizona, and Wisconsin. Calling the right-wing notion that Medicaid recipients are lazy the "fundamental lie of work requirements," Splinter's Libby Watson pointed to a recent Kaiser Family Foundation study that showed "nearly 8 in 10 Medicaid enrollees have at least one family member who is working and a majority work themselves." The vast majority of those who don't work are either disabled or caretakers, the analysis found. "Threatening poor people's lives—which is what getting rid of their healthcare coverage essentially means—is not a way to eradicate poverty, or increase employment, or improve anyone’s lives. It is not, whatever they tell you, about self-reliance or dignity," Watson concluded. "It is simply a way to punish the poor for being poor, and an ideological commitment to being as grotesque as possible." Amid a news cycle dominated by the day-to-day chaos, antics, and scandals of the Trump presidency, new government numbers released on Thursday offered a grim reminder that the humanitarian travesty sparked by President Donald Trump's inhumane family separation policy is still ongoing, despite the fact that it has faded into the background of corporate news coverage. In court filings on Thursday, lawyers for the Trump Justice Department said that 565 immigrant children remain separated from their parents and held in detention facilities more than three weeks after the court-mandated deadline for reunification. While immigrant rights activists and advocacy groups have continued calling attention to the crisis and working tirelessly to ensure that every child is ultimately reunited with their families, much of the media "has largely moved on, worn out and dazzled by other outrages," observed Toronto Star columnist Bruce Arthur. As Judd Legum noted in his Popular Information newsletter this week, "the Trump administration has been able to get away with its disinterested approach to reunification by taking advantage of the short attention spans of the public and the media." "This week, for example, the focus has been on a new book in which a former White House aide, Omarosa Manigault, claims that Trump is a racist. As proof, she claims there is a secret tape of Trump using the n-word on The Apprentice," Legum notes. "Interest in the Omarosa story far exceeds interest in the child separation story, even at its June peak. This week, despite hundreds of kids still in limbo, child separation barely registers." Jeff Greene, the billionaire real estate developer running for the Democratic nomination for governor of Florida, appears to own Puerto Rican debt worth at least $26.8 million, according to a listing on his candidate financial disclosure form. The disclosure, known as Form 6, lists Greene’s net worth as of May 31 at $3.3 billion and lays out Greene’s assets, liabilities, and sources of income. Under secondary income, Greene listed a fixed income holding named “PR Commonwealth Public Impt.” There is no description of the value or the date of purchase. Puerto Rico Commonwealth Public Improvement bonds are a standard type of general obligation debt that the government has issued as far back as 1995. The island is now suffering under more than $70 billion in debt, and creditors have forced crushing austerity and privatization of public assets. It seems logical that “PR Commonwealth Public Impt” would refer to the Public Improvement bonds, but the Greene campaign did not answer repeated questions about the listing. If it does indeed turn out that a candidate running to govern Florida — as well as a significant portion of the Puerto Rican diaspora, after economic depression and natural disaster sent hundreds of thousands of native Puerto Ricans to the mainland — is profiting from Puerto Rican debt, that could generate significant controversy prior to the August 28 Democratic primary. US officials have announced plans to allow increased mining on land that once belonged to two national monuments Donald Trump shrank, and to sell off some of the land despite pledges not to do so. The Bears Ears national monument plan allows for mineral development in lands removed from monument status. It is a goal of the administration to open public lands to increased industrial development. The plans follow Trump’s December 2017 executive order shrinking both monuments by a combined 2m acres, a move that prompted tribal and environmental groups and major outdoor brands to file lawsuits against the administration questioning the legality of the reduction. The public has until 15 November to submit comments on the plans, and officials insist they want to hear from citizens. California’s wildfires are likely only going to get worse, according to the National Oceanic and Atmospheric Administration (NOAA). Firefighters have already battled over 100 large fires in the American West, and the unusually hot and dry conditions will almost certainly exacerbate the problem, scientists from NOAA said during their monthly report on Thursday. In July, for example, California saw its warmest month ever with average temperatures of almost 80 degrees. While NOAA scientists didn’t directly blame climate change for the rise of wildfires, Brown said in a press call that the increased trend in the West, combined with firefighters’ difficulty containing them, “has really taken off” during the past few decades. Climate scientists who have had their research held up this year are pointing to the Interior Department, which added an additional step in the review process for approving funding grants, as the reason they have been hamstrung in their efforts to study the climate crisis and its effects on the Earth. The additional review was put in place by Interior Secretary Ryan Zinke to ensure research "better align[s] with the administration's priorities"—and he appointed an old high school friend with no experience in scientific research or environmental work, to make that call. Steve Howke was named senior adviser to the Interior Department's policy, management, and budget official last fall, after years of working in credit unions. His highest level of education is a Bachelor's degree in business administration, which he earned after playing with Zinke on Whitefish High School's football team as a teenager. "If you were going to design a way to bog things down so not much could happen, you might do it like this," a scientist whose work at the Climate Adaptation Science Centers has been delayed due to the lack of funding from the Interior Department—which controls $5.5 billion for research, conservation and land acquisition—told the Guardian. The Centers conduct research on the climate crisis and how it has been linked to numerous disasters like the destructive wildfires tearing through parts of California and Hurricanes Harvey, Irma, and Maria, which caused billions of dollars in damage and killed thousands of people last year, mainly in Puerto Rico. A federal court has blocked an attempt by the Trump administration to delay safety regulations for chemical plants – the latest in a string of recent legal setbacks for the administration in its attempts to reverse environmental standards. An appeals court in Washington DC ruled on Friday that the Environmental Protection Agency could not delay the enforcement of a chemical safety rule drawn up by the Obama administration. The EPA’s attempt to impose a two-year delay on the rule was “arbitrary and capricious”, the court ruled, with judges criticizing the agency for making a “mockery” of the Clean Air Act. The rule, which came in the wake of a 2013 chemical explosion that killed 15 people in West, near Dallas, set stricter standards for operators’ risk management plans. Plant operators complained the rule was too burdensome, a view shared by the former EPA head Scott Pruitt, who announced the delay in June last year. A total of 11 states allied with environmental groups to successfully challenge this rollback. “Again and again, the Trump EPA has tried to push through policies that jeopardize our health and fly in the face of the law – and again and again, we’ve taken them to court and won,” said Barbara Underwood, attorney general of New York, a state that has fought the EPA on the chemical rule and a host of other environmental issues. Rex Garvin - Oh Yeah! Herblock uses sarcasm to expose corporate practices of laying off employees and reducing their benefits without decreasing executive salaries to remain profitable. In April 2000, as stock prices began to fall, the unscrupulous accounting practices of Enron, HealthSouth, Xerox, WorldCom, and other corporations were exposed. 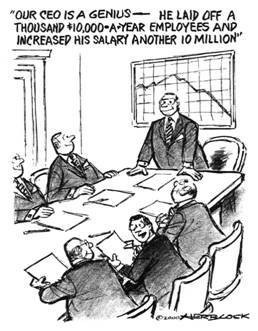 Top executives retained their extraordinary salaries while firing workers. Other employees lost thousands of dollars in stock options and pension income. yep, those ceos are just freaking brilliant at increasing their own compensation and making it appear to shareholders that they have increased corporate value. pfffftttt!! heh, you can tell just what sort of priority the sanctity of our precious fluids elections rank with our legislaturds by the effort that they have put in over the years to assure that they are free, fair and unhackable. which is to say, no effort at all. has been suspended from Twitter. Yes, a permanent ban, apparently. @dervish The official excuse is that she said a mean thing about John McCain. But she's a big supporter of Assange, so I imagine that played a role, too. Meanwhile, Kim Dotcom has his Twitter alternative -- Mastodon -- up and running. That’s really sobering and unsettling if true. She’s one of the clearest and most cogent truth-tellers around. So this is how it’s gonna be, huh? The Social Media Masters take one of theirs, then one of ours. The milquetoast centrists don’t care. They’re content to wipe out what they think is fringe, even though it’s not. Just that they remain willfully ignorant of what’s going on with the punters, in their hermetically sealed worlds of bipartisan cocktail parties and shared donor lists. Taibbi’s last essay was about this slippery slope development. Folks around here will be very interested and concerned. Probably deserves its own essay. We’ve all thought for years now that we’ve already entered Orwell’s 1984. But this is really hitting me now. #3 The official excuse is that she said a mean thing about John McCain. But she's a big supporter of Assange, so I imagine that played a role, too. yep, my guess is that we are going to see a lot more corporate censorship going forward. they'll pick off the low hanging fruit for a while and then go in for the kill on outlets like wikileaks. sorry to hear about the cabin fever. it's been pretty warm and rainy (humid) around here, too. it hasn't been as relentlessly awful as it can get sometimes, though. (crosses fingers) fall will be along pretty soon and it will be safe to come out and play. snoopydawg has a post up about it with more details. i guess we'll see how this thing shakes out. my guess is that this is just the beginning of something far more fascistic, but i guess we'll see. Heard this song a thousand times by a couple of young dudes with a boom box in the bar car of an Amtrak train going from New Orleans to L.A. Stuck with it ever since. Fighting evil, it's hard work. and news. The msm has completely bailed on us and the real news requires the music to digest it. For example, I hadn't connected the blackout of Telesur and the assassination attempt, but there it is and it should've been widely noted and pointed out, but no such luck. Thanks again for all your work. yep, i think we're at an inflection point. i'm glad it's the weekend. Here's one I was listening to today. It's from an album called Quiero Creedence. Conventional lobbying? Pffft. Russians? Triple pffft. Facebook and Google swing elections for chosen candidates by taking a direct and central embedded role in their campaigns. (1) the Merkel government has no idea whom it let in and is now harboring as a refugee. They and the traditional media don’t even want to know, either — that would spoil the narrative and only furnish further grist for the populists’ mill. (2) there really is no “Green / alternative Left” as I understand it any more (pro environment and pro working class but also pro civil liberties including free speech). The idea now seems firmly established that the state, through private corporations, must impose, with all deliberate speed, techno-Stalinist thought control for the greater good. Necessary to “fight bigotry and hate,” don’tcha know. The supposedly Green/alternative-Left-leaning daily taz.de’s political correspondent Bettina Gaus comes out against anonymity and for registering the real identity of everyone allowed to post comments on the Internet. and other laughable things, in this interview on national TV. that i've been able to ascertain. Too little, too late in revamping the party from the inside; sad to say for the country's sake. i don't see an alternative party catching fire, either. Having said that, only hope i frankly see rests with the young folks raising hell. Barbara Lee, which would be stunning, but unlikely. to the Party, but wanted to stop by and say thanks for tonight's edition of EB. Especially, the Common Dreams Medicaid piece. I have a couple articles to share on this topic, later. Still practicing posting Tweets, so, I'll leave you Guys with one of (I suppose) Golden pups.